These days most basketball players and coaches realize the importance of planning and following a solid basketball training program to build muscle, and increase strength, quickness, and agility.It’s a fact that many games are won and lost in the 4th quarter, often in the last few minutes. So that player can withstand the pressure and hold their own in the last few moments are the kinds that coaches want on their team, and scouts want their books. So, if you want to be one among them, join Larry Hughes Basketball Academy and attend all the basketball skills training sessions to improve your game. Imagine getting to the last few moments of an important game and losing it because the other team was strong and out-hustled, out-rebounded and out-ran you to every loose ball. By following a good basketball strength training program, you can be the strongest player on the court and lead your team against any opposition. Below are the top 5 Basketball Training Drills that will help to build strong functional muscle, which ultimately helps to improve your gaming skills. The key to building muscle, especially for skinny guys is to lift heavy weights with low reps. Muscle fibers are stimulated the most when they are forced to lift at their capacity. By keeping the reps low you ensure that are lifting a sufficiently heavy weight without fatiguing your muscles too early. Your last rep on each should be almost impossible to finish. This is known as “positive failure”. Aim to do this in your basketball strength training program for optimal muscle and strength gains. Compound exercise like squat, Deadlifts, and Bench Press work for multiple muscle groups at the same time and should be the focus of any strength and muscle building workout. By focusing on these types of exercise you are able to lift heavier and prevent early fatigue. This will allow you to work out even on game days once you have got your routine going. You are trying to build functional muscle, and so this can be very difficult if you are using a machine that only allows you one axis of rotation. By using free weight in your basketball strength training program you naturally use the smaller stabilizing muscles in your exercise to support the weight and so build better overall strength and muscle, which has more of a real word payoff. Larry Hughes thinks that creating advantages on the basketball court through efficient mental preparation is an extremely good skill that needs to be thought and develop at a young age. 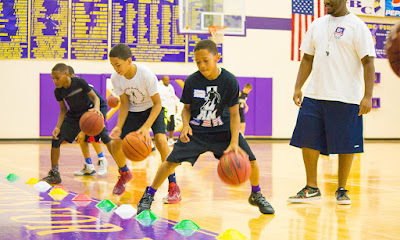 If you also want to improve your basketball skills training, Larry Hughes Basketball Academy is the best bet for you.